Are you ready for a life-enhancing, rebalancing & rejuvenating weekend? You’re invited to One Sky Wellbeing’s 3 night long health retreat. 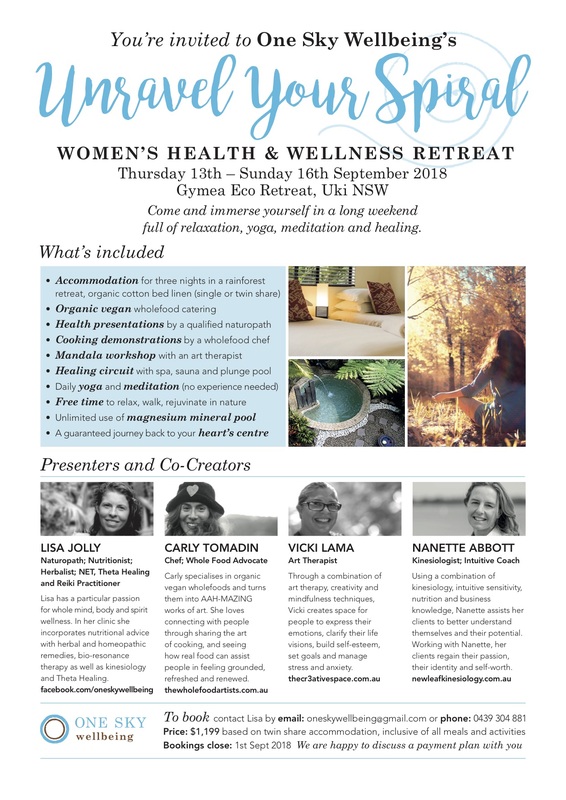 This women only long-weekend retreat will include a combination of yoga, meditation, health education workshops, delicious organic vegan food, art therapy & detoxification. Overall we promise you will leave feeling relaxed, nurtured & rejuvenated. The retreat will be held at the beautiful & healing Gymea Eco retreat, located in Uki in the Northern NSW hinterland. COST: $1,199 twin share. Deposit of $300 required to guarantee a spot (payment plans welcome). Individual rooms are available for an additional $150.